Our estimated delivery time is 3 working days for 90% of the products we sell, however delays by several factors (OOS, suppliers fluffy, etc.) can occur so our good time may be delayed in that case it will contact the client indicating that situation. The remaining 10% will be given depending on the availability of appropriate vendor, and will indicate the approximate delivery time to the customer. For shipments to the Canary Islands and Ceuta Melilla please select the country in the PAIS Select "SPAIN CANARY ISLANDS" or "SPAIN CEUTA MELILLA". If your selection is wrong your order may delayed. Once your purchase is authorized by the payment gateway you choose (credit card, cash, bank transfer ...) will send you an email confirming the order and products purchased. This document contains your order number that you made the purchase. Then we notify the shipping company to make you get the order. The transport company is MRW. TNT, FEDEX , UPS, Post Service. No orders will be delivered to PO boxes. We send orders for Military USA Customers to APO/FPO by Postal Service. What three working days means? To calculate the delivery, you should consider several factors. First, "working" means "working"; ie on Saturdays, Sundays and holidays do not count. In addition, we must take into account local festivals in Barcelona, ​​where our central warehouse, which are generally on January 6, May 1, August 15, September 11 and September 24 is. The customer will receive an email confirming receipt of the order placed. The order is not final until payment has checked MOTO-SEGURA.COM the total order and conformity. MOTO-SEGURA, for logistical reasons or force majeure reserves the right to change the default carrier (MRW, UPS, TNT, FEDEX or Post Office), by either one or the other, without the customer can claim for this reason. You may cancel your order by sending an email to info (at) moto-segura.com. If already made payment shall be retrocession payment by the same method that was made. If credit card, this cancellation may take 24-48 hours to appear on the customer's account. 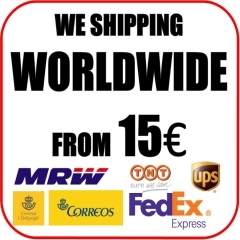 If have already made shipping, transportation expenses back and forth will be deducted in the Peninsula to 2kg € 14.26 International shipping and greater weight or inform the customer of that amount. Prices include 21% VAT where applicable. Published by MOTO-SEGURA.COM prices do not include administrative expenses, customs on arrival will be paid by the customer, shipping or installation. 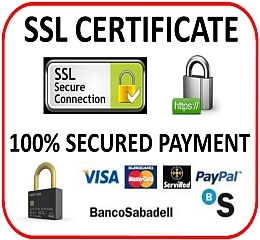 MOTO-SEGURA.COM accept commercial returns, only for consumers, of products within the first 7 days from the invoice date of the order. After that period, the products will be considered compliant and accepted by the customer without complaint possible. In case of commercial return and as the law foresees, will be deducted from the refund the amount of freight, expenses, taxes and supplied, these being at least 7.14 € for Spain and 50€ for international shipments or the amount to be communicated to the client, after requesting the number RMA by sending an email to info@moto-segura.com. This refund will occur within 30 days of receipt of the goods and checking their status. If the material is returned last 7 calendar days MOTO-SEGURA.COM will refuse to accept the goods returns. If the customer refuses receipt of the shipment, is not collected and / or it is returned, it will cancel the order and refund the amounts paid by the same means in which the payment was made in a period not exceeding 30 days and a deduction of postage and a charge of 40% of the order amount for administrative costs will apply. In the case of orders placed customized or custom configurations 50% charge will apply for administrative expenses. Commercial Warranty conditions do not alter or affect the conditions of Legal Guarantee.